Skinnygirl Cocktails is the first to offer consumers a cream-free, low-calorie version of a drink that can pack over 800 calories and is typically only consumed on vacation. At under 100 calories per 4 oz. serving, Skinnygirl achieves the impossible by presenting a guiltless pleasure that instantly provides that feel-good vacation vibe. The first rum offering from Skinnygirl, the cocktail tastes just like the tropical favorite- minus the fat, cream and calories. 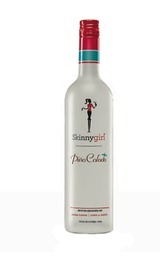 Skinnygirl Piña Colada offers pleasant coconut and vanilla notes complimented by the fruitiness of fresh pineapple in the background. The finish is dry with subtle notes of rum and the mouthfeel is thin to moderate (as this is not a thick, coconut cream-based product).